Separate eggs. Whisk egg yolks with confectioner’s sugar until pale and fluffy. Add Amaretto and mascarpone. Whisk until smooth. Beat egg whites with a pinch of salt until stiff peaks form. Slowly whisk in the remaining confectioner’s sugar. Now, carefully fold beaten egg whites into mascarpone cream. Combine espresso and remaining Amaretto in a shallow dish. Dip ladyfingers in espresso mixture and then layer soaked ladyfingers in bottom of the serving dish. 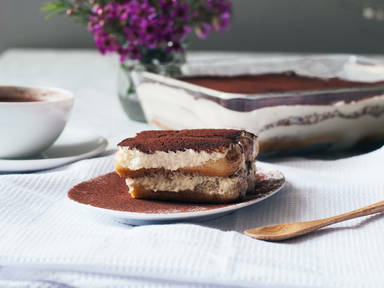 Cover with a layer of mascarpone cream and top with a fine layer of grated chocolate. Repeat layering process until all ingredients are used up. Finish up with a layer of mascarpone cream and dust with unsweetened cocoa powder. Refrigerate for at least 3 hours before serving.